But this is still a Zuckocracy. 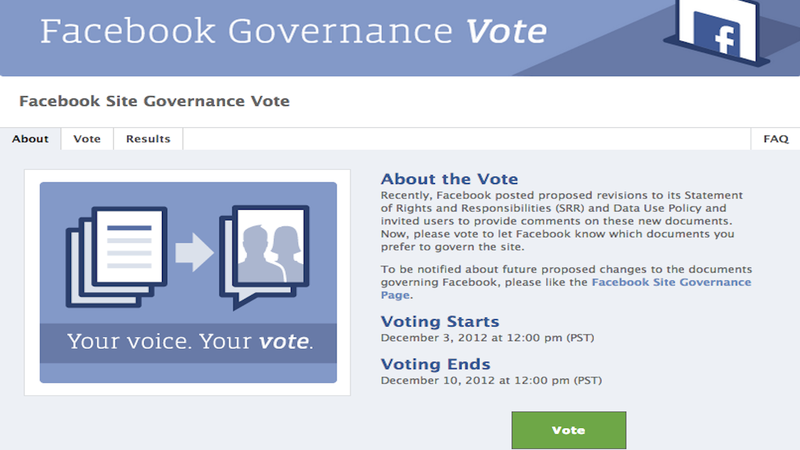 In the very likely case that less than 30% of the site's 1 billion users actually vote and a majority don't reject the proposal, Facebook will revoke users' voting rights on any future policy or administrative changes. If over 30% vote, the verdict will be binding. In addition to deciding the fate of the Facebook suffrage movement, users will be voting on whether Facebook can share data between its affiliates (Instagram being the major one). Also on the chopping block is the site's ability to decide who's able to send you private messages and whether users will be prevented from using personal profiles for "commercial gain," which will be strictly relegated to a Facebook fan page.